Oha ' yo-mi ' ~ ! A very very good morning ~ Today, my blog will be updated with many many posts. I hope that it will keep you entertained for a while! The 'Otona Make-up by Kiyomi Lim' and 'Daily Contour'. 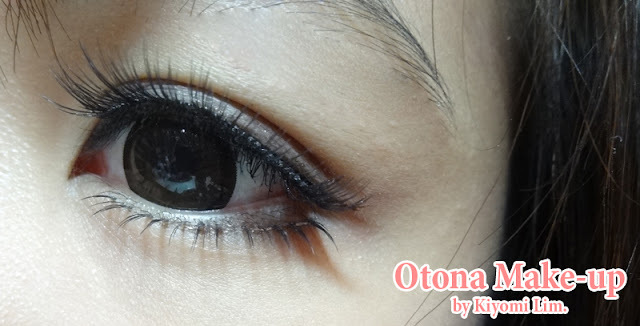 First of all, I would like to do an introduction about my latest Otona Make-up video. This make-up was somewhat inspired from Murata Mari. I have been viewing her pictures and wondering how do she look so 'classy' most of the time, while still having the tinge of Gyaru's cuteness/ innocence. It would be funny if you did dramatic gyaru make-up for a casual lunch at a reknowned restaurant. However, you do not have to fully 'give-up' on those falsies or eyelid stickers. Style is still style, you don't have to throw away everything(your usual make-up) just to suit the event. You can choose to blend in a little of everything to make you look presentable but still maintain your usual 'features', so that there won't be drastic changes to your face. Plus, if you see a huge difference in your make-up, you might not feel comfortable with it too. It is important to customise your make-up to suit you. So here is my Gyaru-Otona make-up video and I hope that it does some help for you girls to explore into something same yet different at the same time. Next I would like to show you girls the video on my daily contour. I feel that it is important to make a video specially for daily contouring as contouring really makes a significant difference. I believe that every little things that improves your look will add up to make your overall look much better. So every little things do count! I hope that these videos are inspirational or helpful to some of you! Thank you for reading this space of mine! See you all back here this evening! Byebye!